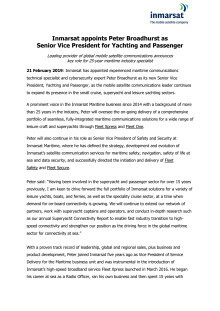 At Palma Superyacht Show (27 to 29 April) and MYBA Charter Show (1 to 3 May), Inmarsat is announcing its latest news and introducing its new Senior Vice President, Yachting and Passenger, Peter Broadhurst. 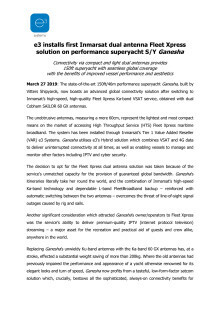 New partnerships with boatbuilders and increasing installations on superyachts such as SY Ganesha are ensuring that Inmarsat, the leading provider of global mobile satellite communications, is expanding its presence in the superyacht and leisure yachting sectors. 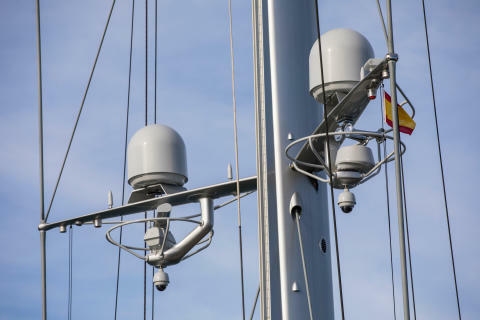 Demand is growing for its seamless, fully-integrated maritime communications and cyber security solutions through its Fleet Xpress and Fleet One service packages. Peter Broadhurst is available for media interviews during both shows this year. He will be pleased to discuss the latest news, as well as cyber risk in yachting, how communications are evolving in the digital society and how to capture the best solution for the yachting sector. Please register your interest as soon as possible with your preferred show by replying to this email to Jules at j.riegal@saltwater-stone.com.